The service was due to be run using Mercedes Citaros (I assume it is – I have not seen any yet). Certainly the Citaros we used to have on the 50 have now gone, replaced by Enviro 200’s yesterday which is nice! Between them services 1/1A and the 76 offer up to 7 journeys an hour between Wolseley Road Flats and the City Centre. And from Alma Road (Central Park) between them services 1/1A, 4, 76 and 83 offer up to 13 buses an hour to/from the City Centre. And dont forget our weekly ticket is just £11 " thats unlimited travel for 7 days on all of the above services plus the rest of our routes across Plymouth, Saltash, Torpoint and Ivybridge, including our Park & Ride PR1 And PR2. Hop on and off as much as you like while the ticket is valid. In fact if you use it every day it works out at just £1.57 a day! I saw the fleet number '4' on the 50 today. It was struggling! In the last two days (2nd and 3rd Dec) I have seen 31, 32 and 1 Citaro on the 5/5A services. The T-reg batch are an improvement on the N-reg ones which were regularly on 5/5A before 1st December. Yes the Citaros have been seen on the route. They have used Citaros on the route, although can't say for sure whether every single service is being covered by a Citaro, certainly the ones I have seen have. not a brilliant start for 5/5A. waited 28 mins for bus from Royal Parade Mon 5pm. Bus late, me late for work as work in Saltash. Due to traffic congestion and knock on effect from picking up lots of school children earlier. On another note, spoke to two drivers Tues morning and they said the route in Saltash had been timed for average speed of 30 mph when most of this part of the route is in a 20mph zone? how can this be? Also is it true that First have untill the end of March/April to sort things out? heard this from several sources including drivers from both companies? There have vbn rumours flying around re First pulling out next year if no turnaround however they were also pulling out in October this year nand given Citybus deciding to compete on all of the main first routes from October I think they would have gone then if thet were going to. I do not believe there has been any discussion with unions or anything yet so for First staff sake lets hope not. However, First really do need to attract more customers, I believe that most Citybus customers do not realise how much they can save by swapping to First, I have and my monthly pass has gone down from £58 (2 zone) Citybus to £40 with First for all of Plymouth (they go were i need)Saltash, Torpoint and Ivybridge! Janner for example may I ask why you are paying more than you need. First run every 10 mins from City to Saltash, no cross city rubbish, and all fares are much cheaper with them than Citybus who you are waiting ages for? All along that route First are cheaper eg Wolseley Road Flats to town £2.40 return Citybus, £1.50 First! So what route is the 777 goung to take in full. When will first start southway and plympton routes please? I have lived in Saltash for the last 14 years having moved from London. I clearly remember all the cross London Greenline routes being reorganised because of the late running caused by the routes runing across the city. I am therefore suprised that Citybus have introduced a cross city serivce with the introduction of the 5/5A service. Why is there so much anomisity on this site between ex Western National and Citybus correspondents? Here is a surprise. First Devon registration accepted (VOSA) Service 777, Railway Station to Railway station via West Hoe. A rival to Citybus 25 by the looks of it. Hope there is more to come! I wouldnt get too excited by the 777 as it clearly states it is to operate for just three days only! While it is always possible that First may decide to compete with the 25 they certainly wouldn't start it in the middle of January and not for just three days! Bus 4 isn't too bad! The N-reg SLFs on the 5/5A would've more than likely been down to vehicle shortages, as until October 2013 it was all 54-plate Darts, however in October lots of Enviro 200s appeared on the route, so we can assume that in October/November the 5/5A was allocated Enviros and the elderly Darts were used as replacements for breakdowns etc. Having spoken to a driver the 5/5A is allocated Citaros on the duty cards though several Darts do appear - saw a 54 plate SLF the other day. Don't get too excited. If you look closely, it's the occasional user who will see large increases but First is clearly trying to encourage people to buy longer period tickets by simplifing the range and weighting the fares appropriately. Any further fare cuts in Plymouth won't help that part of the operation return to profit quickly though which has to be the most important objective. Low fares aren't going to be sustainable in the long-term and (I hope they won't but) if they're found to be deliberately running at a loss to compete with Citybus, they will quickly find themselves in trouble with the authorities. You can be sure that Citybus will be keeping a close eye on what they think First's likely costs and revenues are - they would be mad not to! Passengers in Cornwall already see the fare reductions in Plymouth as being unfair, these increase will just add to that feeling. It could appear to some that passengers in Cornwall are subsidising fares in Plymouth! To be honest I think they are to an extent Graham, but at the end of the day that is Firsts' choice, even if they are deliberately running at a loss against Citybus... PCB would not have a leg to stand on running to the authorities as G states... as it is the customer that wins and ultimately up to Citybus to fight for their customers... it can come out of their 4% profit margin. First have got Citybus by the short and curlies so to speak, they have 2 choices reduce their fares as well and lose revenue, or stay as they are being very expensive in comparison to First and lose revenue, not a good choice is it? If Citybus choose to stay as they are and First stay around, they will continue to lose customers as PCB season tickets come up for renewal and people come to the end of their 12 month contract with PCB etc. If Citybus choose to cut fares.. If First pull out in 12 months time they can not put fares up 100% so it will take years to get fares back where they were. First management have for once played a blinder and left Citybus with egg on their faces. First does *not* have that choice. They need to be very careful. Cross-subsidisation is not permitted and the authorities WILL take an interest. Technically all routes (even journeys) are supposed to be self-sufficient in revenue/cost terms and if (and I say *if*, as I hope it's not the case) that First is deliberately running a service at a loss to destabilise Citybus then it would be considered as unfair competition. The circumstances are not quite the same but intentionally running at a loss was one of the reasons that Cardiff Bus got done a few years ago. The effects of that case has affected how an incumbant operator can react to new competition and probably explains why Citybus's response to First's new service has been muted and equally First's limited response to Citybus's new 12 and 32. In terms of a dominant position to abuse, First is the minority operator in Plymouth. The majority operator with the biggest market share is PCB, thus it is they who will find themselves answering the 'abuse of dominant position' questions like Cardiff Bus did. First have nothing to lose here - Citybus have elected to grow their business and increase their market share, at the expense of First. Of course, First can use profits from elsewhere to prop up D&C - and they've been doing so since the early 2000s. They can adopt the 'going concern' basis on that principle and carry on trading. I did say the circumstances were not identical but I repeat, again, First has to be careful. There is a big difference between running a business that is losing money and starting a new route that charges silly fares. If the 6 can cover its costs at £1 a trip then fine but if it doesn't, they should not be continuing to run it or they should charge more appropriate fares. All very interesting supposition, but lets stick to the facts. First separates out its three South West operations - South Devon - Cornwall - Taunton/Bridgwater - all are separate business units with their own financials. Neither Cornwall or Somerset 'subsidise' South Devon (Plymouth). Your suggestions that they do are fantasy. Cornwall's fare changes are to sort out the viability of Cornwall, nothing more, nothing less. Yes you are right - the facts are that they do operate as separate business units, As an enthusiast and someone who has closely followed the bus industry form any years I know this to be true. I was not suggesting that Cornwall subsidise Plymouth fares. I was pointing out that many passengers in Cornwall will think this to be the case. Although Cornwall and Devon are separate units they share the same website and facebook pages. It is only in the last couple of years that First have introduced local fleetnames to at least try and show some sort of local ownership. Its only now you can see a difference between First Cornwall and First Devon buses. Anyone going onto the web sites/ facebook will see one company making announcements. At the moment they will see fares rising in Cornwall and many fares being reduced in Plymouth. Passengers see these as all coming from the same company - they wont know, or care that they are separate units with their own cost base. You are right in your last statement - Cornwalls fare changes are to sort out the viability of Cornwall. There are particular issues which are hitting fares and services in Cornwall very hard at the moment, many of them not First's fault. However, if you go to their web site right now and click on News & Initiatives (http://www.firstgroup.com/ukbus/devon_cornwall/travel_news/news_initiatives/) the top item is fare changes in Cornwall then the next five items are various reductions and offers for Plymouth. How you see this will depend on what side you live in. First can arrange its finances in any way it likes and apply budgets and cost centres in a multitude of ways - modern accounting systems allow all kinds of flexibiility in this regard and is no doubt one reason that the management structures often don't align with the operator licences any more - they don't need to. However, legally and as far as Companies House and HMRC etc are concerned Devon & Cornwall is one company and will have to file accounts covering both business units as one i.e First Devon & Cornwall Ltd. Again, not difficult with modern systems. The Somerset part is legally still part of First Somerset & Avon Ltd and the Taunton/Bridgwater figures will have to feed into that company's accounts for tax and regulatory purposes etc. Thanks G! I am pretty sure they are not deliberately running at a loss just to get at Citybus- as you say this would indeed be jumped upon by the authorities and I cant imagine First HQ or indeed First shareholders putting up with that either.. My comment about Cornish passengers subsidising Plymouth passengers was careful to point out some passengers could come to that conclusion when they read about all the changes. Indeed if you look at their facebook page many passengers are highlighting this issue and how unfair it looks to them. No, I'm not suggesting that they are, Graham. Some commentators seem to think that First can do as they please and thus walk all over Citybus. They can't. Indeed Graham, the regionalisation of First created some odd merging of activities...but no doubt the future strategy will see some even more interesting separation of those activities! G. You are applying far too simplistic a basis to competition regulation. As it happens the 6 is rocking anyway. Of course I am. The original point is still valid. Citybus have now cur their fares to £1 on the 8 & 9 obviously geting desperate from losing customers to first 6 to do it now. Toi late now the customers are lost. Yeah from what I have heard most Efford/Laira customers are happy with First 6, and just see Citybus been ripping off for years. Thefirst 6 is very popular in these parts and Citybus will not gain much back now by cutting their fares... It's too late the damage is done. First are well in control here. 3a picking up also... interesting to see over past few weeks along Peverelll Park Rd for eg, people waving the Ctybus 35 by and getting on the 3a behind... Citybus drivers not used to this look notice\bly shocked as well. So what will Citybus do when First begin their next town routes charging £1? What goes round comes round for Go Ahead! I do agree first cant do anything they like but they are allowed to fight back to to the bully boy tactics of city bus and total dominance they seem to want in Plymouth. They wanted Plymstock and they have it. now they are going for Saltash and Tavistock. Tptally agreee Anon 11:15.. for an example of an awful managment decision that has backfired hopelessly look no further than Citybus decision to go to Tavi/Torpoint. First were on their way out of Plymouth, possibly even before Christmas but will now fancy their chances here, Citybus have played straight into their hands, as many customers will not swap back to Them as will see it that they have bn ripped off for years. Firsts 6 is an unbelievable success, and Citybus 8/9 with lower fares and less customers will now make a loss instead of a nice profit. This is an open goal for First to start cheap say £1.25 single £2 return fares to Southway and Plympton, forcing Citybus into a loss here too. What goes around comes around and the bullys at Citybus will regret not being happy with what they had. Thanks Mr Carter and welcome to Plymouth. Could anyone put a figure on what sort of loading is the break-even point for a bus service - at £1 a ride or at £2 a ride? If the 6 is rocking, I wonder how many of those passengers are people who would not have used a bus at all rather than just transfers from Citybus. Citybus' £2 flat fare went down like a lead balloon - but would a £1 flat fare throughout the city draw passengers from cars, thus reducing traffic, thus speeding up the bus, thus making it more attractive and filling it up? $40 passengers at £1 each must surely be profitable. Every route is different. It's perfectly possible these days to run full buses at a loss, especially if a lot of the passengers are concessions as the bus company will only receive around half the normal fare as reimbursement. Shorter routes are better than longer ones in theory as there is more churn i.e. more people being carried shorter distances, so seats being reused over and over. You guys really believe that First can make money by running routes at £1 a ride? Actually, yes, I fear you do! That will cover all their overheads and also provide the cash to replace the old bangers with some more old bangers when the time comes, will it? It's total cloud cuckoo land and Plymouth really deserves better. Over 1000 passengers a day on the 6 now. Think how much revenue that is that Citybus have lost, then multiply it by 6 days a week and 50 weeks. Oh dear GoAhead, there goes your profit! It works both ways. Who knows if either company is making money on the competed routes? In your obsessive glee, don't forget to deduct from First's revenue streams the cash that Citybus has taken from former First customers on the 12 and 32. Money that First has lost and won't see again. As I've said many times here, the only way that this will work without tears is if both operators concentrate on growing the market rather than squabbling between themselves. That said, when I passed through Plymouth a couple of weeks ago, I was impressed with just how many people the Blue Flash was carrying - it certainly wasn't just fresh air as some people on here seem to want to claim. And yes, people were letting 83s go and getting on a 12. Indeed the 6 has picked up dramatically - I've even seen standing loads on some trips! Anon 11.15, I wholeheartedly agree. The 12 isn't too bad with reasonable loadings, however the 32 Citybus must be regretting. I think they've just got too carried away. They had Efford, Plympton, Southway, Tamerton, Eggbuckland, Leigham, Honicknowle/Brake Farm and West Park/Crownhill Road etc to themselves. The 21/21A at peak times has standing loads in deckers, the 50 is a busy route also. I just think they've got far too greedy, and the 12 (and 32 especially) they must be regretting given the huge success of First's 6. The 3/3A seems to be doing well too. Except that any loss in revenue at First is offset by the reduced costs of operating. Looks like about 20% cut in operations on the road. Presumably Go Aheads mileage increased by contrast? 1000 passengers per day? Do you have a link to the press release or whatever that substantiates that? Or are you just guessing or 'talking to a driver'? There's a bus every 15 minutes between 7am and 6:30pm, so around 46 trips in each direction, 92 both ways, therefore about 11 passengers per trip with max revenue of £11 per trip, which in reality will be less as a number of those passengers will be ENTS concessions. If they're only getting say £7/£8 per trip, that's barely going to cover fuel let alone driver wages and everything else. How long can they keep that up? Oh dear First, there goes your profit! G. First can do what they like. They aren't trying to put a competitor nder using a dominant position. they are responding to a big operator who is trying to create an absolute monopoly. You need a dose of realism. Oh dear, you have completely missed the point. That's too bad as I'm not going to argue with anonymous people. I don't think anonymous has. There's nothing First is doing that is anti competitive. Anonymous, you need to change your name to A. Then you won't be anonymous any more, you'll be just like G! Anonymous(es): if you actually read what I wrote rather than what you think I wrote, you would see that I haven't accused First of doing anything anti-competitive at all. They need to play by the rules just as Citybus do (but we weren't discussing Citybus at that point). It's a shame that Anonymous(es) feel the need to jump on any comment and turn it into pro-First/anti-Citybus point-scoring. Yes, it would be a good idea to use a name (even 'A') - we might then have a chance of following each discussion properly. Whereas First's management have much experience - their MD is on a temporary contract but was the man who devised the Hoppa minibus for WN in the 1980's. He has brought a new focus to the business, being a genuine outsider. Yes, First need to invest, but they are better placed to invest, and can divert new stock if needs be to meet a competitive response. Their value for money buses on the £1 route are fully depreciated, cost them nothing and are low floor. They will do for a few more years and they are ideal for making a little bit of money whilst PCB have heavily invested in new double deckers and need lots of bottoms on seats to pay for them. Clearly they've taken a long term view - but there's a lot of expenditure going in. Go Ahead, nationally are pressing all companies to contribute towards a £100m profit target - thus they have to expand and they are doing so in an aggressive fashion to try an gain a monopoly. Look to the Isle of Wight and Salisbury and see how they abuse a monopoly position - sky high fares, poor quality service (the Island being an exception due to its modern fleet, but anyone should be able to make money there given the situation) and cap in hand to the council for lots of lovely subsidy. Be under no illusion that Go Ahead,if they gain a monopoly will slash off peak services that aren't subsidised and will rapidly increase fares. As would First if they gained a monopoly. GA, operate a poor service where they hold a monopoly and ensure their attention is always focused on the competing corridor. Not that First have a good track record for quality in the West Country. Go Ahead aren't doing this out of kindness for the people of Plymouth, they are seeking to gain a monopoly in Plymouth. They seek First's routes and their exit from the city, citing their continued under investment. If they win, head office management and support staff will be made redundant and there might even be driver redundancies. Some at PCB of course remember First's massive expansion in Plymouth at a critical time when Citybus was up for sale, designed to make it plain to any purchaser they meant business and weren't going anywhere. When Go Ahead bought Citybus, First reduced their competitive presence. Citybus have a continually updated fleet, and before privatisation, they had a comprehensive service across the city. No doubt Citybus staff feel strongly about the values of their operation. Hence why they may view this as their payback time. Yet Plymouth can support two operators on the major corridors, which will keep fares down and both operators on their toes. Competition is actually good in the marketplace where two operators can live side by side - what does neither any good is a stalemate situation on services that don't support two operators - like Tavistock. First can afford to lose money, they have done so for 10 years in Devon & Cornwall. Go Ahead, need to make a group wide bus profit of £100m can't afford a fares war, can't afford for their costs to rise above their income. They need to increase their income but contain costs. Putting brand new double deck buses on a competitive service is one way to increase your costs drastically - First don't have this problem. If Citybus' have got this wrong, expect to see job adverts for a new Managing Director and a new team of people. Central HQ in London will not permit them to make a loss for very long. From an interested onlooker, who works for neither side, but has experience of dealing with one side. Yet again you continue to peddle this scare-mongering nonsense and allow your obvious dilike of Go-Ahead to stop you seeing the wider picture. I just love the way that you're more than happy to berate Go-Ahead and applaude First for doing exactly the same things. You claim that if Citybus starts losing money then they will cut services and raise fares - exactly what First has been doing for years and years, is it not?. You seem to think that Go-Ahead won't tolerate losses at Plymouth but happilly concede that much of GSC loses money (I can't comment) and has been doing so for years. So, if much of Wilts & Dorset, Solent Blue Line and Damory are loss-making, why are they still in business, or at least not drastically scaled-back? Yet, you expect First, a company that's been in such dire financial straits, it recently had to dispose of £100million worth of assets, to continue to accept losses in Plymouth. Clearly Go-Ahead overall is in a much stronger financial position (and has a much larger Plymouth business) and can weather any storm for far longer to retain its Plymouth operations in the long term. Anyone operating on the IoW would undoubtedly charge similar fares as Southern Vectis does. First would as well, it's normal business practice, you charge as much as the market will bear. However, the IoW is something of a self-contained, special situation. You can't assume that if First left Plymouth, that Go-Ahead would decimate off-peak services and whack up fares. They could but you can't guarantee that would happen any more than I could. Instead of comparing with the IoW, go and look at Brighton & Hove, Metrobus (both monopolies) or City of Oxford. All have expanded services, times of operation and become popular, highly-respected operations. I'm not saying their fares are necessarily the cheapest but they've balanced increasing revenue with heavy investment and growing passenger numbers, so people are obviously not boycotting the buses due to supposed 'sky high' fares, are they? No reason to think that couldn't happen in Plymouth and perhaps off-peak services will increase and even go 24-hour, as has happened in say Crawley or Brighton. I couldn't agree more with Anonymous (17th December) - Plymouth would be so much better off if both main operators could concentrate on getting people out of cars and on to buses; with less traffic on the road everyone's journey would be quicker. That is why it is such a pity that the Park and Ride has been downgraded - for many motorists, that is their first experience of a bus since their schooldays. Competition is very wasteful of resources - before First pulled out, Barne Barton had fourteen buses an hour, nearly all double-deckers. That was 1000 seats an hour - enough to empty the whole estate in half a morning. The nature of Plymouth's bus service seems to be changing. It always used to be relatively infrequent services penetrating deep into estates so that no-one was more than a short distance from a bus stop; these services then came together and combined to give a frequent service along the main roads. A number of sections of road have now lost their bus service because parked cars have made the roads unusable for buses - and others will follow; St. Pancras and Woodford are two areas which come to mind, and Efford cannot be easy for a bus driver. Competition, though, is fought on the main roads - and that is where both companies are concentrating their resources. I can see the time coming when the network is of high-frequency services on the main roads and not very much in between. Depends why first are running the 6 doesn't it? Is it to make money or is it to put down a marker that across the uk they are no longer going to sit back and let Go Ahead walk in without a fight. ook at Southampton and East angles where Go Ahead just go on pushing their operating areas over time. 1000 passengers a day means at least £1500 a day that Go Ahead have lost. Please explain exactly how 1000 passengers a day at £1 fare (and many at far less, being concessions) equals £1500? You're about double the real figure, surely? As I said in my comment on 19/12, there is no way that 1000 passengers a day can cover the costs of running the route. Trust me the £1000 per day quoted on the 6 is an under estimate, First are wiping the floor with Citybus in this area hence Citybus fare reductions as a panic measure. The 3a is also picking up. Yes the 12 has got passengers but not nearly enough to cover Citybus outgoings for this route and as for Torpoint,,this is a complete disaster for Citybus, First have over 90% of customers here still..even after Citybus cut their fares.. Local drivers from Torpoint mean a lot over there hence First winning hands down. First are valso picking up new customers in areas of Plymouth such as St Budeaux/Milehouse etc. Citybus are and will continue to regret this aggressive action against First, trust me. If the 32 is that much of a disaster then I expect Citybus would look to cancel it in due course. It wouldn't be the be-all-and-end-all and if you don't try these things, you won't know. Bear in mind, though, that First is only going to survive in the area if they can keep enough buses busy to cover their fixed costs and then start making money. I remain to be convinced that the 6 can make any money at its current level of fares (and I suspect Citybus is of the same opinion, hence the targetted fare initiatives, or 'panic measures' as you call them). Citybus doesn't need to win every battle to win the war. I got on the 20 today due to arrive at Royal Parade at 1140. Sixteen passengers, (all paying) got on at Laira Library. I think First really are missing out here - this is a very busy stop full of paying passengers every time. A further two along Old Laira Road, and four at Lipson Vale, by which time the bus, 203 was full with a standing load. Yes, in a full-size Dart there wouldn't be people standing though it does go to show Citybus thismorning at least are still keeping customers along this stretch, with 22 paying passengers boarding one trip. There was around four passengers who let the 20 go by and waited for the 6 behind us. I appreciate that one trip on one of the busiest days of the year isn't a true reflection on how well a route is performing overall, however given that just four passengers let the 20 go by, I do wonder if the 6 had been in front of the 20 things would've been different? Think you're misreading my posting. Go Ahead are the ones who've set themselves a group wide target to achieve £100m profits across their bus operations by 2015/6 and it their recent developments in Plymouth which are clearly designed to ensure PCB contributes its share to this target. I doubt very much its developments will ensure that target is met, so we shall be seeing new management in there by 2015/6. There's a few former Cornish colleagues watching this adventure with much interest as this time, the architect will stand or fall by his own decisions. I take it from the tone of your response, that you're either connected to or are very high up at PCB - I can't help but conclude you're either at PCB or somewhere within Go-Ahead given your need to attack a poster who doesn't like your group very much. Whether I like GA or not isn't that relevant, as the OP was asking why this bus war was so personal. You've gone way distant from my posting just to attack me, making a number of misinterpretations in the process. Sorry if you can't accept that people don't take the corporate nonsense spouted or have the ability of own self thought to see around press releases. I assume btw you're talking about the same Brighton & Hove that recently had a formal warning at PI over wheel loss incidents btw? I assume appearances at PI are some kind of benchmark by which us operators need to base ourselves? I learned that a decent operator should always strive to avoid trips to the traffic commissioners. GA have become a very centralised operation under their new chief exec - it is said this is removing much of the devolved nature of the business. The much respected MD of B&H left this year, too. I'd say B&H, plus COMS have a lot of issues themselves - COMS of course works in an area where Stagecoach is kept very much on their toes and are seeing growth at COMS expense - the route sharing agreement hasn't worked well for them and they've bought low cost units which take their attention away. GA is rumoured to be buying Western Greyhound (which has a lot of problems) and I can envisage PCB controlling that and sharing certain functions. All stuff you really don't need with you've got First fighting back with literally nothing to lose. I don't think it's much of a secret that big groups can operate loss making companies through the others baling them out. First has rather more buses than GA and rather more operations. I think the well trodden path of what happens when one operator obtains a monopoly in a given area is well known. Fares will rise, frequencies will drop. Looking more locally, Plymouth is a small operation in size terms within GA, and one that should generate a decent profit provided the management don't have big cost increases faster than income received. Launching Blue Flash is bold and very risky in that climate - it will take a long time to generate a return. All fine if you've costed on that basis, but the entire bus operations in GA must generate £100m profit by 2015/6. 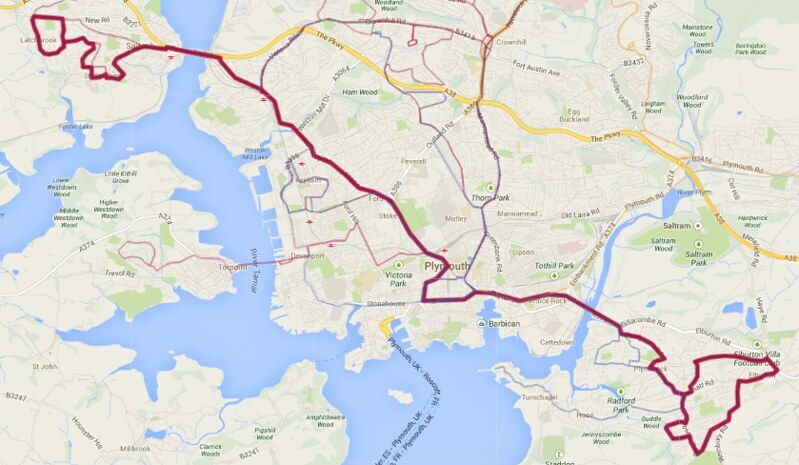 And in Plymouth, both operators can compete on a level ish playing field, offering their own type of services on certain busy routes. You couldn't me more wrong. I have nothing whatsoever to do with Citybus or Go-Ahead (or First or Stagecoach, for that matter). I'm just trying to balance and counter some of the wild claims and assumptions that get presented as fact on this board. I'm not even that much of a Go-Ahead fan - as you say, things have changed and become much more centralised with the new brooms at the top in recent years. That said, they have some very good operations, some excellent marketing and some superb service development. And yes, some not so good ops. As for Brighton's PI, yes, not good but First has had more than their share of run-ins on maintenance too across the country. I'd be very surprised if GA bought WG, there's nothing there worth having, it would be a complete waste of time. Anonymous, 24th December - you state that there is probably scope for development in Plymouth. However, to me it is difficult to see where. Obviously Sherford and any Chelston Meadow development will offer an opportunity for new services, with Sherford in particular needing frequent, high-capacity links to the city centre either via Plympton or Laira Bridge. Enough for light rail? However, where within the current city area is under-served at present - or which links are missing? Buses do seem to be retreating from inside the estates and keeping more to main roads but, as I have said before, a lot of this must be to do with parked cars. Who would try to get a bus through Underwood in Plympton now? What is there which needs developing? I wasn't talking about specific areas of the city, it's not all about just adding extra routes, it was more the opportunities that should be there to develop what already exists with better frequencies, better links, better buses, pushing evening and Sunday services, better marketing, branding, punctuality, general consistency of offering and - importantly - working with the Council to develop bus lanes, bus priority measures, real-time info, better shelters, buses triggering traffic lights, perhaps disincentives aimed at keeping cars out of the city centre, more/better park and rides, the list could go on. I'm not saying that some or all of this isn't happening already (it clearly is) but there's plenty more that could be done and certainly Go-Ahead (at least) has much experience of this kind of thing nationally, and no doubt that expertise is available to PCB to tap into as well.